In this chapter I want to get down to the rock bottom essentials of drawing. One cannot hope to draw without first understanding what form is, how to search for it, and then how to express it. Here below is a very simple example of the right and wrong way of drawing a simple object. I have chosen a pendulum, a rod passing through or behind a circular disc. 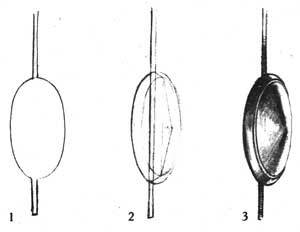 Now very few people would be so stupid as to draw down one side of the object, and up the other as in figure (1). For one thing the rod would probably fail to come out at the bottom of the disc in the right place, and secondly the elipse of the disc would be inaccurate. The obvious way to tackle the problem would be to draw the rod first then put the disc over it as in figures (2) and (3). If this is drawn lightly the construction lines can be rubbed out afterwards. In a portrait this method is applied for instance when we wish to ascertain the correct position of the shoulder. We draw a light line through the neck from one point of the shoulder to the corresponding one on the other side. This also helps to set the pose right. 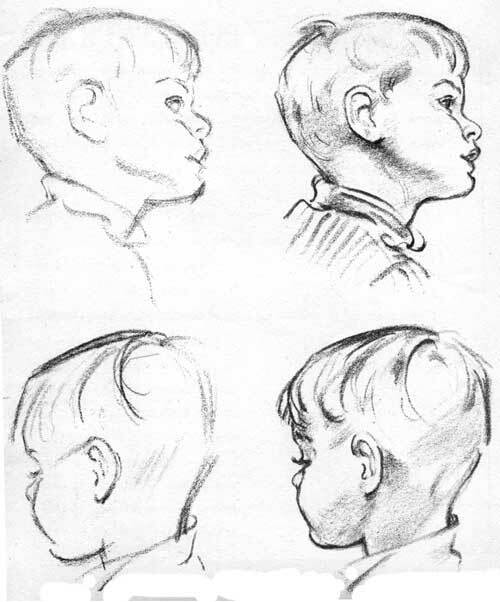 By drawing the general mass shapes of heads, necks, shoulders, etc., one can check up on the correct proportions and angles in relation to each other. 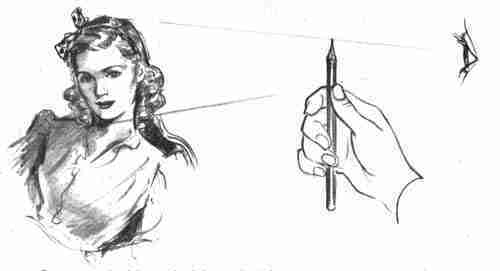 The best way to make sure of measuring the proportions of your sitter correctly, is to hold a pencil at arm's length by the forefinger and thumb (see illustration) so that it comes between your eye and the sitter. Next, see that the top of the pencil is level with the top of her head. Now by moving the thumb down the pencil to the bottom of her chin, we have established a scale of proportion to work to -- that is, we can, now measure how many times the head goes into the body, the forehead occupies a third of the length of the head, and so on. After a time you will find it is possible to measure these things automatically by judgment of the eye alone. Try to look for the broad character of the shape of the head. Search for the bold angles. 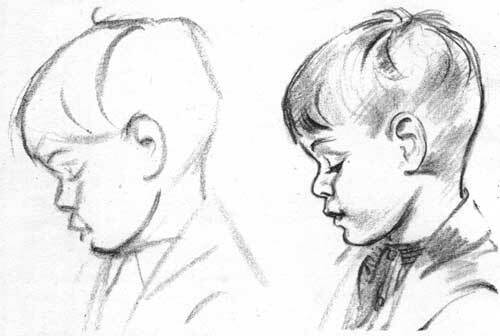 Take for example a child's head, note the high rounded forehead, sloping inwards towards the bridge of the tiny upturned nose, then the outward thrust of the cheeks and upper lip. The under lip goes back almost behind the surface of the cheek in profile, and then the small rounded and slightly receding chin to the neck. The top of the head, almost flat, tends to slope upwards to the back, down and round then suddenly inward down to the small neck. Notice the position of the ear in relation to the eye, angle of the head compared to that of the body.